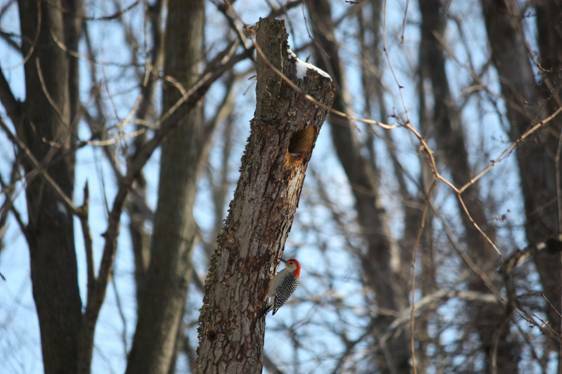 “In the above picture a Red Bellied Woodpecker has made residence in a dead tree. I was fortunate enough to view this while taking a walk down the mostly frozen Poquessing creek. Hopefully in April or May there will be little woodpeckers. Unfortunately, this location is also under siege from the returning European starlings. European Starlings are an invasive nuisance who were purposely introduced in 1890 by organizations such as the American Acclimatization Society and the Portland Song Bird Club. 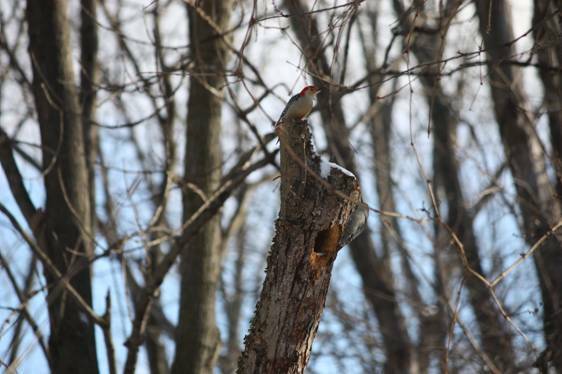 These birds typically nest in cavities such as the one formed in the picture above by the Red Bellied Woodpecker. Twice while I was there, a starling had the audacity to land on the woodpecker’s property, and twice the Red Bellied Woodpecker had to deliver a sharp peck to the intruding black bird before it flew away. Below the entrance hole, you might have noticed the tree has been thoroughly pecked at. I believe this is due to drumming, a method most woodpeckers use to attract mates, but it could also be due to other reasons such as an insect infestation. If it is due to drumming, it seems a female is interested. The shot with her in it was the last picture I got before a large, blundering, creature scientifically known as Nicholassus idioticus tried to approach the nesting site for a better shot and scared away both woodpeckers. Aka myself. Female woodpecker checks out the male’s handiwork. 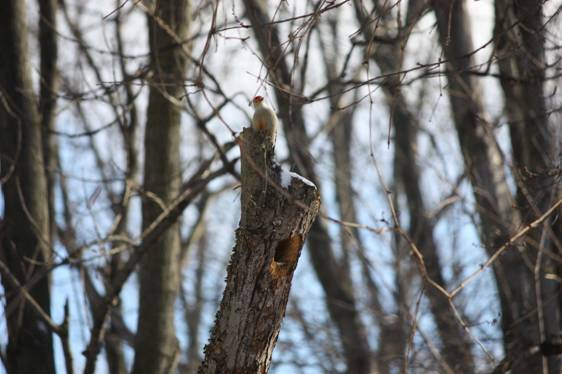 Both woodpeckers keep watch for the threat of more starlings.